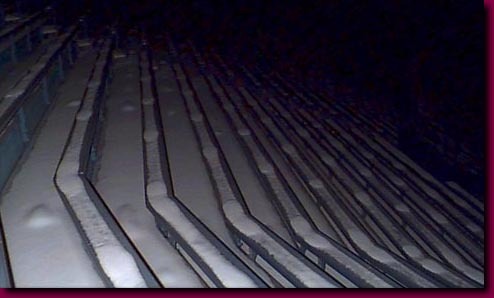 Winter solace cloaks the bleachers of Detroit's famous Tiger Stadium. "Last Strike at Tiger Stadium"
An uncertain future faces Tiger Stadium. Construction of a new Tiger Stadium in the Fox town area of downtown, which has resulted in the destruction of several prominent buildings, has been completed and Tiger Stadium now sits empty. 1999 marked the last season of Major League Baseball played in this historic ball yard.